A PAINTER WHO believes her left hand is her guardian angel. A man who feels like his head is exploding every time he orgasms. A chef who loses his memory for six hours. As a neurologist, Professor Niall Tubridy has come across all sorts of fascinating and strange cases. The brother of RTÉ broadcaster Ryan, Niall – who works in St Vincent’s Hospital in Dublin – followed in their psychiatrist father Patrick’s footsteps by working in the medical industry (their grandfather was a GP). Now he has written a book called Just One More Question: Stories From A Life In Neurology, about the types of cases he’s come across in his work, but also about what he’s learned from neurology. It’s a book that will fascinate you with the patients’ tales (they’re amalgamated and anonymised) but leave you at the end pondering the notion of what life really is. As a young man, Tubridy wrote stories, but when a couple of people told him they weren’t very good, he gave up the pursuit. Later in life, he decided it was time to put pen to paper again. Every day, Tubridy has to break news about diagnoses to people. He has to tell them things they might not want to hear. His approach has evolved over the years, and he’s also learned that each person is so individual in terms of what they want to be told. He sees himself as trying to unravel the stories of people’s conditions. At first, his career was about learning the ropes, and the more he worked the more he got interested in “what layers lie beneath” each diagnosis. I love the stories, and some are slightly bordering on the sad and some are not so sad. Some are weird: symptoms a lot of us have a lot of the time. A lot of us wake up with a numb hand now and again, shake it off and move on, but other people obviously can’t. The older I get the more confident I am and clear about what I’m doing, the physical stuff, but the psychological stuff… [the] background to each person has become more fascinating. He says he learned from his ‘old school’ psychiatrist dad that the best approach was to “listen, listen, listen”. “And that’s something I’ve had to develop – I wouldn’t have been the world’s best,” he laughs. Like his brother, he’s a great chatter. “My dad was certainly a big influence, just a kind guy. Whenever I saw myself doing the wrong thing, I tried to adopt more of his kind bits,” he says. One of the most common diagnoses he has to give is MS, and it’s most often young people to whom he’s handing that news. “MS can present in myriad of ways but it still comes around to young, usually young, people having a weak arm or weak leg,” he says. It was easy to conflate the stories for the book, as the road to diagnosis tends to be similar. Women often ask if they can have a family, while men will ask can they still work – “slightly old-fashioned” approaches, Tubridy acknowledges. The answer is usually yes to both. “And if it goes as bad as the worst case scenario can be, no one can do anything really about that,” he says. Most of the time it’s going to be OK and that’s what we’re here for – to try and treat, monitor, and there’s new treatments, new drugs. So I’m much more truly and honestly positive and optimistic about it. It’s the truth. He wants to show with the book that doctors have imperfections – they don’t always get it right. He is more confident with age, and says he has more insight, but can still get things wrong. Then there’s Dr Google. Most people, before they get to his office, “have googled themselves up to the hilt”. Not at all, as it turns out. People often come into him having “run themselves round in circles of clutter of worry” and need some direction. But sometimes there is no answer. In the book, he details how there are some cases where there is no concrete answer, where a case cannot be explained. But he does think that constant internet use “has cluttered all our heads”, causing stress which might manifest in symptoms. So they say, ‘oh gosh, I’m getting tightness in my chest or pins and needles in my hands or my face’. Google that – they’re not going to get ‘you’re having a panic attack’ or [are] anxious, you’re going to get MS, wheelchair. Or at least that’s what I think our cognitive bias leads us to. Over the last three to four years it’s been “peak Dr Google”, where “people are now googling so early that they are finding themselves in a place of chassis and worry before they’ve even had time to think about it”. But he does admit that it is “quite frequent” that someone has googled their symptoms and pre-empted the correct diagnosis. This used to make him feel insecure – but he says it’s the opposite now. “I’d see it much more positive they are informed,” he says. With some patients, the answer might just be doing nothing. They might be asked – given all their circumstances – if they can live with the situation for six months and monitor it, see how it goes. “And it’s not always the answer but it gives people great confidence to say right, I’m in control of this rather than the doctor being in control,” he says. That’s one of the biggest learnings for him: people want to feel in control of their lives. His only caveat is with something like MS, “if you go heavy complementary therapy and only complementary, there is no evidence to show it works so I would always go use the word complementary as an adjunct to other treatments”. He has seen an increased use of complementary treatments: “…cannabis oil, everything under the sun”, though sometimes people won’t admit what they’re taking. “But the psychology again is very important and if they feel it’s helping them, as long as they’re doing it in conjunction with a bit of conventionalism what’s lost?” he says. “I used to be a little bit sharp about it, I used to think it was wrong.” But he’s mellowed on this – within reason. I enjoy my job. If you see a lot of bleakness or badness you say gosh stop whinging about your broken car or your dodgy washing machine. You do worry a little bit less. 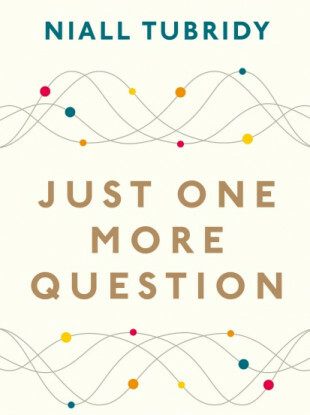 Just One More Question is published by Penguin Ireland and in bookshops now. Email “'I can feel the tension, the worry': Niall Tubridy on what it's like to give people a serious diagnosis”. Feedback on “'I can feel the tension, the worry': Niall Tubridy on what it's like to give people a serious diagnosis”.